Multi-instrumentalist Dwayne Elix cranks up a storm with his band The Engineers. Dwayne also performs a stirring tribute to the late Hank Williams in his package show, Settin' The Woods On Fire. 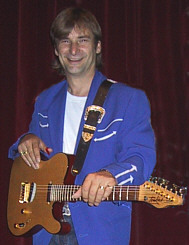 As well as his own discs, Dwayne also played on the last recordings of the legendary Johnny Duncan who recorded She Took The Engineer, a song co-written by Dwayne.